Goff Couture | Sewing and Designing to my heart’s content! One of my favorite moments in the creation of a custom bridal gown is the first fabric fitting. At this point, the gown is unfinished. It’s not hemmed, most of the seams are merely basted together so they can be altered as needed, and any embellishments are not yet in place. Nevertheless, it’s the first moment ever that the bride steps into the actual gown she’ll wear on her wedding day. After taking that leap of faith, to have something made from scratch, after investing time and energy and creativity and money – and then *waiting* – at last she’s able to see her gown, in the flesh (or in the fabrics, as it were! ), taking shape. And in the case of Hillary’s dress, I think we’d both imagined that moment a few times in the years we’ve worked together. Needless to say, it was a highly anticipated fitting! When she actually tried on her gown, it was like magic. I’d had dozens of possible design ideas before we started, but seeing her in that actual dress, I knew we’d settled on the right concept. I couldn’t imagine any other gown being so splendidly suited to who she is. It was as though the gown spoke aloud and said “Hello, I’m Hillary. I love vintage styles, I’m madly in love with Justin and I’m getting married this spring.” Hillary’s bright smile and nonstop use of the word “perfect” let me know she agreed completely. In addition to being just the right design, the fit was perfect and didn’t need even minor adjustments. Splendid! I could move forward with finishing the construction. The second muslin for her jacket was much improved over the first but needed a bit more tweaking to be just perfect. We marked the changes that were needed and I took meticulous notes. I asked if she could accommodate an extra fitting, to be absolutely certain we had the jacket pattern just right before cutting into the lace, and she agreed. After that third mock up, we were certain the jacket was just right. It was splendidly fitted, the sleeves were exactly the right length, the neckline crossed high enough to be as modest as she wanted without looking severe (or like it had taken so many attempts to make it sit in just that spot!). Up next: constructing the actual jacket! For nearly all custom work I take on, I insist that we include a mock up as part of the dressmaking process. It’s positively crucial to confirming that the fit, shape and style of our custom design are just right. No matter how thorough a set of measurements I take, there are often little details to fit that are hard to anticipate. No matter how carefully we’ve discussed the design and reviewed the sketch, there’s always a chance my client and I don’t share quite the same vision of what the final garment will look like, and it’s much better to review and adjust the design, if need be, before we’ve cut into the expensive fabrics of the final garment! Even when we are on the same page, sometimes we discover that on her actual body, a slight change to the design may flatter her better than what we originally planned. For all these reasons, I like to make a full mockup whenever possible, and fit it to my client in person so we can fine tune the fit and design. Hillary’s muslin fitting was a delight. We were both thrilled to see the design taking shape. I got to see her SHOES for the first time that day too. Remember how I said I thought she’d want some surprises? Her shoes were killer, and a more modern element to pair with her vintage inspired gown. Hillary also brought a petticoat she had purchased elsewhere to wear under the gown, and we determined it wasn’t quite full enough or long enough on its own. So, I would add an additional layer or two to the lining of her skirt to give the extra fullness we needed. 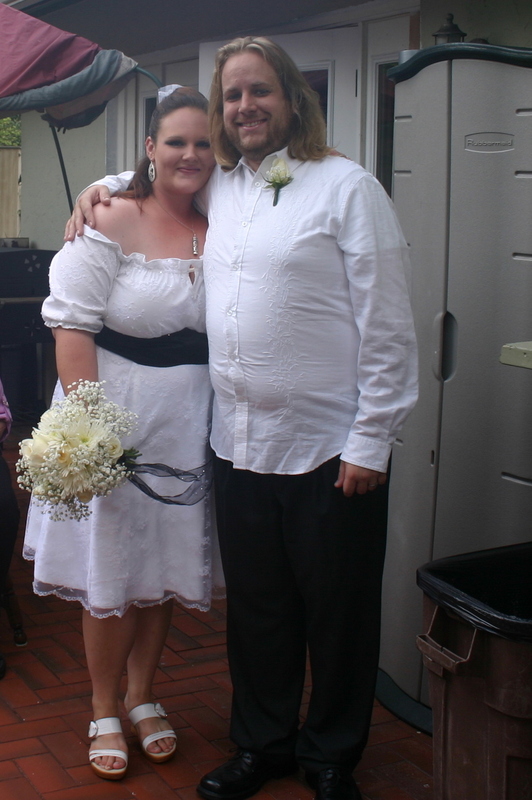 In terms of the dress itself, I started with a bit of extra ease in the bodice, and we pinned it out in just the places we thought most flattering. The skirt was all done with knife pleats gathered onto the waistband; some of them were deeper than others and we decided we liked the fullness of those deeper pleats best. The sash needed some adjustments to fit, and we marked them on the mock up. The jacket needed adjustments too, and because the lace was our priciest fabric, I suggested I make a second mock up to be sure the adjustments were just right before we moved forward on the lace jacket. Another detail we discussed at her muslin fitting was the neckline for Hillary’s dress. I started with a very high neckline on the muslin, one that sat just barely below her collarbone, so that we could adjust downward from there. Once we tried on the jacket mock up, we determined that the jacket would provide the coverage Hillary wanted, which meant the neckline of the dress itself did not need to be so high. I suggested we establish a completely different neckline for the dress, dropped lower down, and that we reserve that “second look” for her and her husband to enjoy privately. She was thrilled with the idea, and we spent some time discussing the shape, the height, and marking out an extremely flattering, distinct neckline for the dress that only the two of them would know. It gives me a great deal of joy to be able to include such details for the bride and groom, that may not be visible to any of the guests at their wedding and might not even be saved in any photographs, but that contribute a little something special to the experience and meaning of that day. 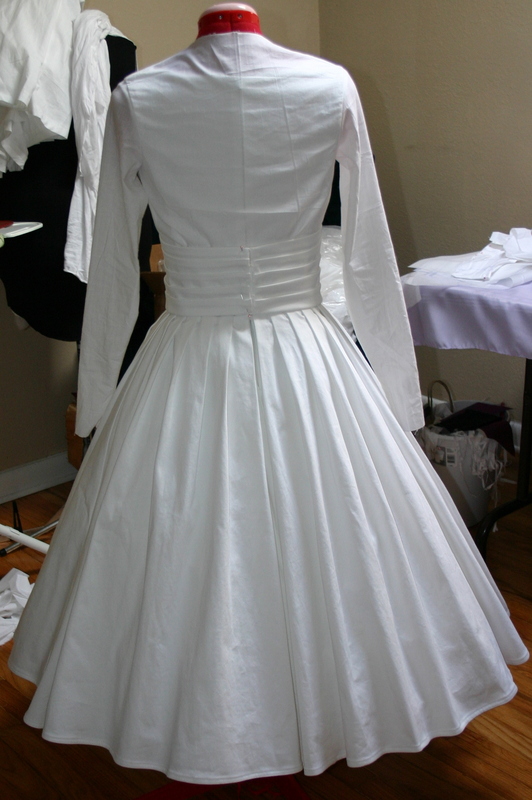 The end result of her muslin fitting was that we both felt we could safely move forward on the *actual* dress and sash with the minor pattern adjustments needed, and that we must make a second mock up for the jacket to be certain it would be perfect. Up next: beginning work on the actual dress at last! By the time we sat down officially for Hillary’s first appointment, we’d already looked over several inspiration photos and discussed design elements we might incorporate. In person, our conversation was even more lively and dynamic. It didn’t take long to settle on the features we wanted to incorporate. 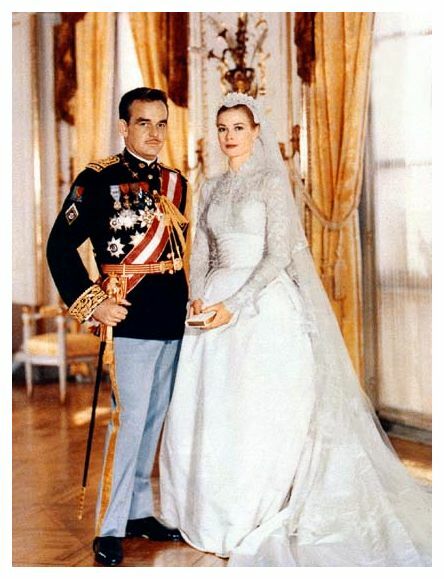 Our primary inspiration was Grace Kelly’s wedding gown, but Hillary’s gown would have several differences. We were thrilled with the idea of satin with lace, buttons at the wrist, a pleated skirt and pleated sash, as in Princess Grace’s gown. Hillary’s gown though would be tea length, continue to widen towards the hem (where Grace’s gown came full and wide from the pleats at the waist, and then fell nearly at a straight line down to the floor length hem). 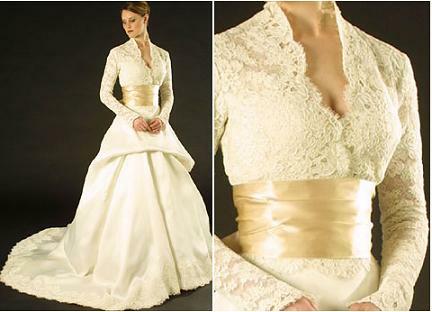 Hillary’s gown would also feature a frothy petticoat underneath. Her jacket would wrap over the front like the Monique L’hullier gown, with a higher neckline (but not near so high as Princess Grace’s neckline). Hillary’s veil would be a considerably simpler birdcage style veil, and would incorporate lace motifs in the same fabric as the jacket. I put together a quick sketch for Hillary, to which she gave her full approval. And I wrote up the garment description for us both, to which she giddily replied “Grace Kelly is in my wedding dress description!” We had a plan. In our next post: fabric selections and additional considerations. Well fast forward to June of this year, and Brian and Sara let us know they had some big news: they were engaged, and expecting a baby. Do you plan to take Brian’s last name? At first, Sara thought it would be better to find a simple ready-to-wear sundress for the big day, and perhaps enlist my help to alter it or add some special touches to give it a more bridal feel. They planned on a brief engagement and a casual wedding, and going all out on a custom gown seemed unnecessary. But, when she went searching, the sundress of her dreams was nowhere to be found. Sara is a breathtaking woman who has a beautifully proportioned full figure. She has an hourglass shape but, in a plus size and with a baby bump starting to grow, the options are limited. Since at least part of the wedding was to be held outdoors (in August, in Florida), she wanted a lightweight breathable fabric like cotton. 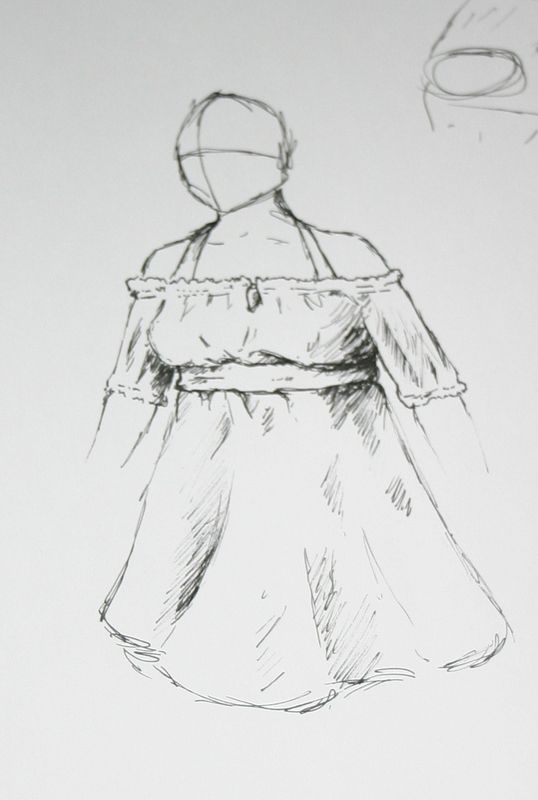 For the most flattering fit, she ideally wanted something empire waisted, A-lined, and knee length. She never wears sleeveless garments and her wedding day would be no exception – so this cotton sundress would need to have sleeves. She couldn’t find anything to meet those criteria anywhere, and time was rapidly running out. 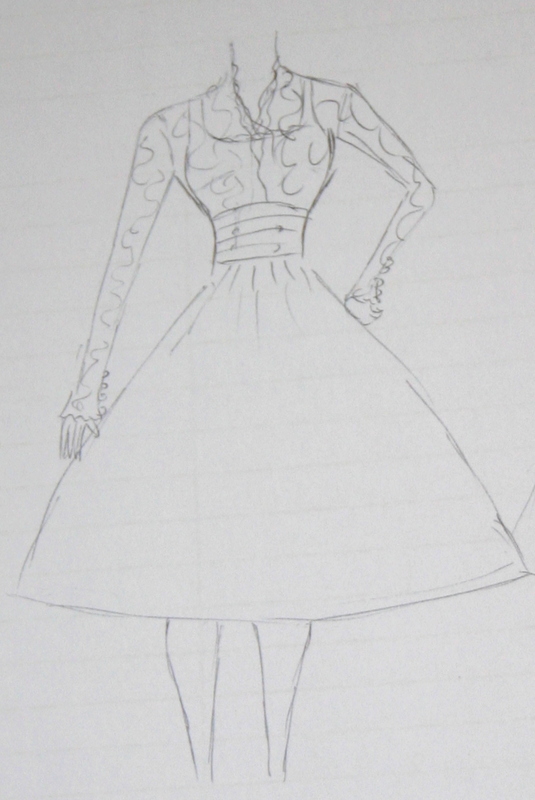 I told her that if the design was simple enough for it to be possible, I’d be happy to make her dress for her. For clients, I almost never agree to take on rush orders. But Sara’s family now and that’s a whole different story. Before this, I’d have told you it wasn’t possible – but Sara and I created her wedding dress in just over two weeks’ time (largely in my off hours, as I also needed to continue work for my existing client)! 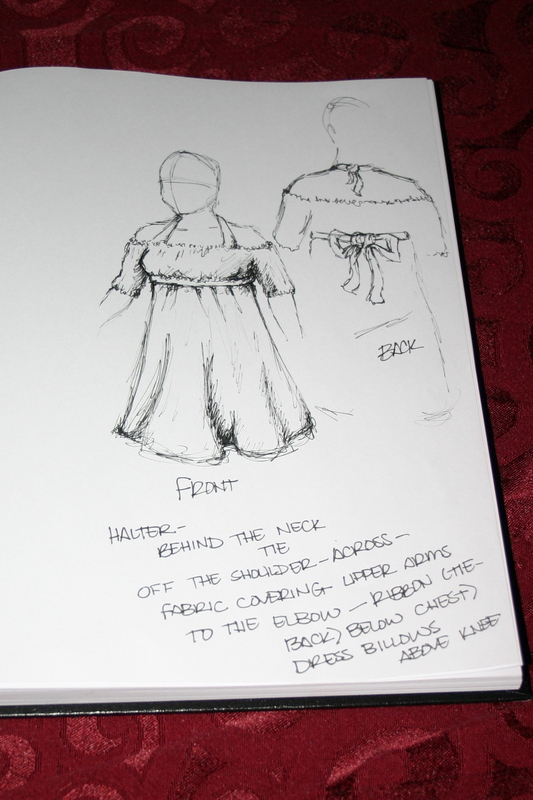 One of the things that made it possible was that Sara used to design and sew a lot of her own clothing. Apart from having a clear vision of what she wanted and how it would flatter her figure, she also had an idea of what sort of design would be simple to make. She also had the ability to convey this design clearly and quickly to me. Sara sent me a sketch, I made a couple of suggestions, and we set a time for her to come over to get started. Before she came, I pulled out every scrap of white fabric in my stock. Due to the time and budget constraints, we needed to use materials that were already on hand as much as possible. 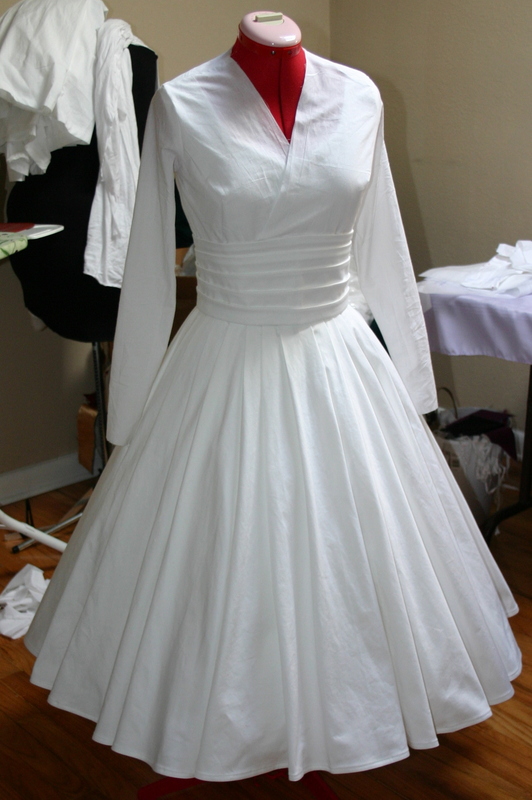 As crazy as it felt to suggest it, I offered cotton muslin as my recommendation for the main fabric on her dress. I buy muslin in bulk so I knew I had plenty to use for the main and lining fabrics, and I knew it would breathe well and feel soft against her skin. I also knew that muslin looks like, well… muslin. Unless you do something about it. 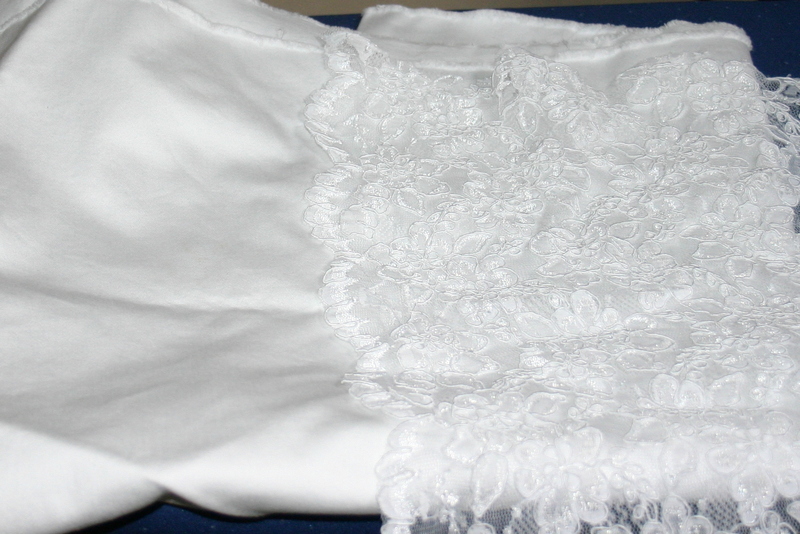 I also had a length of white lace I’d purchased long ago for a vague idea that never took shape; I thought it would be great to add a lace overlay to the muslin. The lace was a nice open mesh that would maintain the lightweight, breathable comfort of the muslin but dress it up considerably! Sara agreed to both fabrics. We turned our attention to the sash she wanted to wear around her waist. 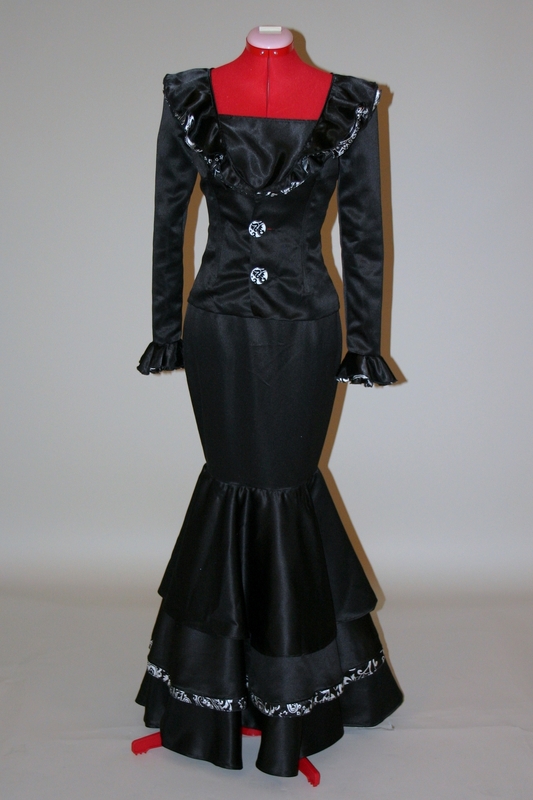 I suggested we use black fabric for the sash, which would match the flower girl’s dresses. As fortune would have it, I had about a half yard of black satin leftover from some prior garment. We were in business. I took Sara’s measurements and she took our daughters to another room to distract them while I frantically drafted a pattern, and cut out some muslin for a quick mock up. From the time she stepped foot through my door until we finished her mock-up fitting took only three hours! And, half of the mock-up was useable in her actual dress. We were efficient little worker bees. From there to completion only took a couple more days’ sewing, and about a week of hand beading in front of the TV in the evenings. This was by far the fastest little wedding dress I’ve ever made. But what delights me further is that at a glance you’d never guess this was thrown together in two weeks using leftover materials. For all our haste and thrift, it actually is the dress she wanted! The wedding was lovely. They had a casual, intimate ceremony, with close friends and family in attendance. 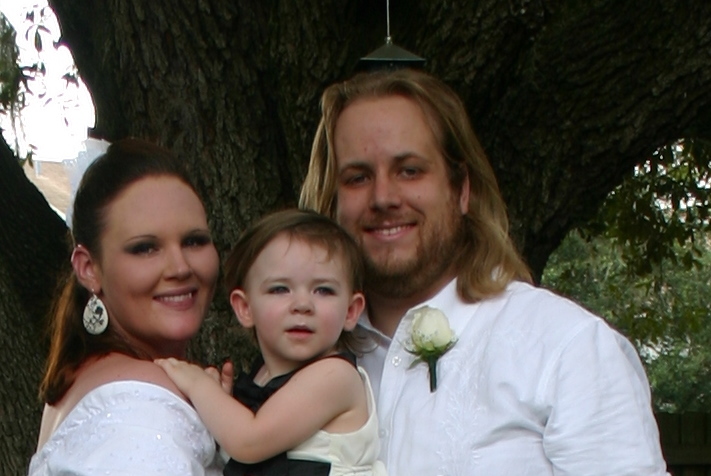 I was so happy to be able to contribute to their special day! 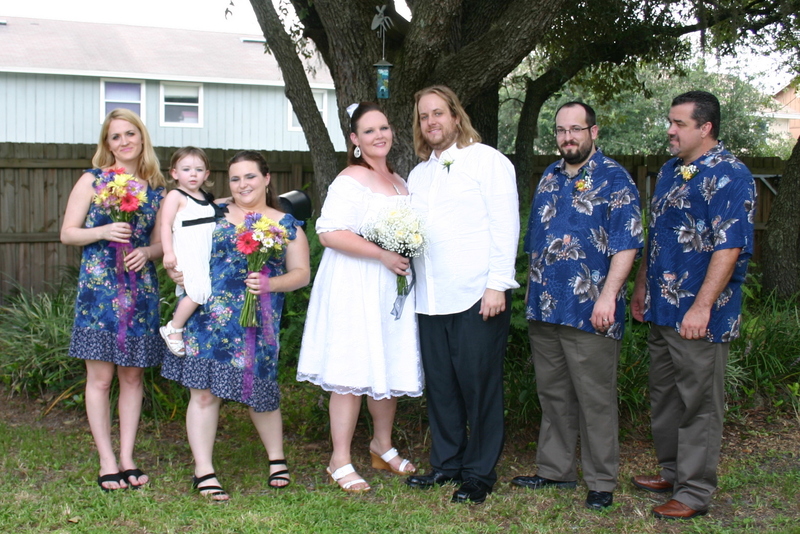 Since my husband and daughter were both in the wedding (and, since I am apparently a crazy person) I decided to make my dress for the wedding as well. Something simple and casual, that would be comfortable in the summer heat but that was decidedly newer than most of my wardrobe. 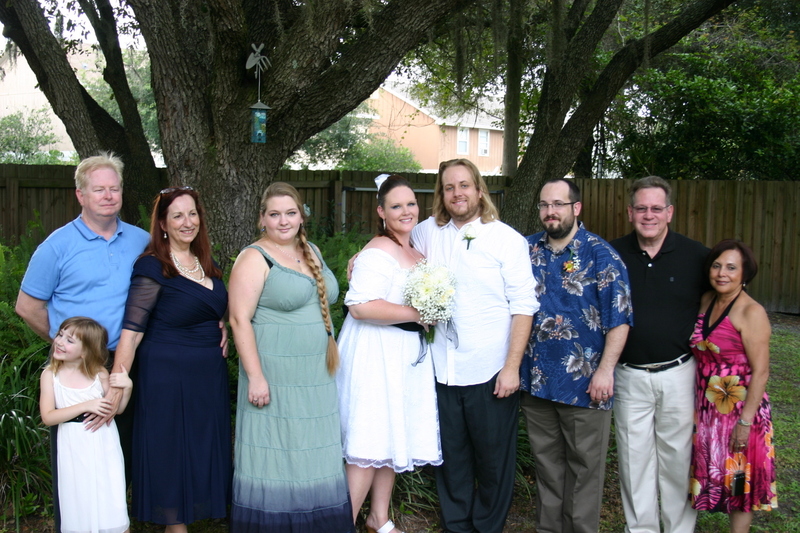 Here we are together with the rest of the groom’s family. Oh! And in case you wondered about that other question I asked her back in June: Sara’s hyphenating. 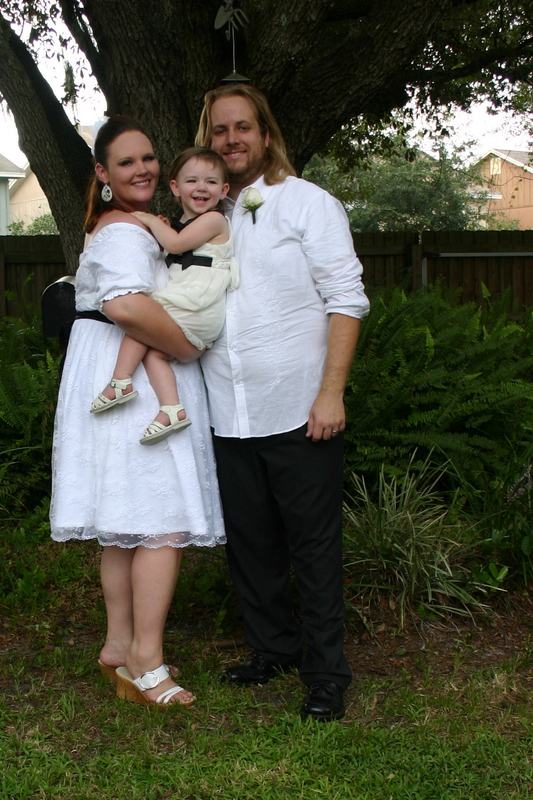 Congratulations to Brian Goff and Sara Eatherton-Goff!